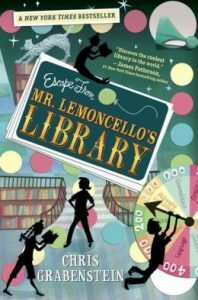 Escape from Mr. Lemoncello’s Library, by Chris Grabenstein. Random House, 2013, 304 pages. Age/interest level: 8-13. Kyle Keely doesn’t care much for books, but he loves games—all kinds of games, from board to horde. So he’s not devastated by the fact that the town library has been closed for a couple of years. But when the world’s foremost game designer, Mr. Luigi Lemoncello, returns to his home town in Ohio (which happens to be Kyle’s as well) to remodel and reopen the library as a top-of-the-line technological marvel, he’s got Kyle’s interest. Especially with the announcement that twelve twelve-year-olds will be chosen to participate in a library grand-opening lock-in mystery game: the participant who solves all the clues and escapes from the library will enjoy a year as the #1 promoter (and tester) of Mr. Lemoncello’s games. To no reader’s surprise, Kyle wins a place on the team, and it’s no spoiler to say that he will triumph, especially over Charles Chilington, preppie snob and saboteur. Escape from Mr. Lemoncello’s Library is marketed as a “puzzle book,” with narrative clues and situational pointers that are supposed to lead to a solution. 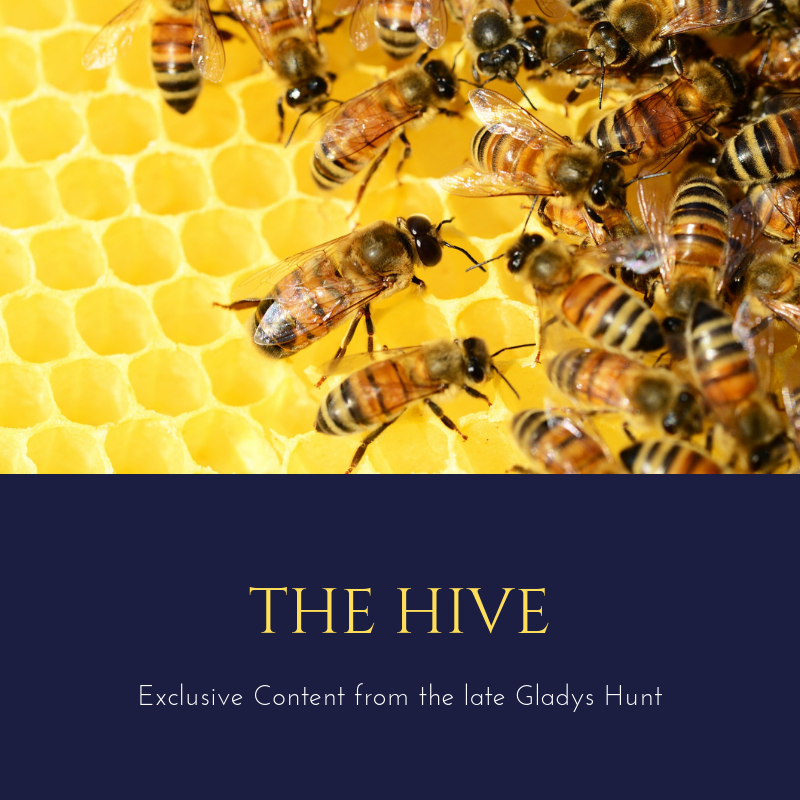 Already a bestseller with many enthusiastic Amazon reader reviews, it sounds fun, and certainly is fun for the age group. Not so much for older readers, who will inevitably be reminded of Charlie and the Chocolate Factory. To me the imitation seemed almost slavish: perky, enterprising hero, eccentric Master of Ceremonies, fantastic machinery, exaggerated plot lines. It’s also very similar to The Gollywopper Games by Jodie Feldman, a 2008 novel carried off with more aplomb. Mr. Lemoncello seems a bit slapdash with characterization, which is actually okay for this sort of book. But less excusable is the lackadaisical plot which seems to rely entirely on “Event”—one noisy thing after another, in this case a series of clues that solve the mystery. In a well-plotted mystery, one clue builds on another to lead to the solution, but here “clues” are planted mostly to get the players from one step to another. So it’s more like a treasure hunt than a mystery. This book has been favorably reviewed by library journals because it’s so positive about reading as the launching pad for imagination. At least, that’s the stated message. Mr. Lemoncello credits his hometown library with inspiring his career, and in the course of working through the puzzle Kyle actually reads a book. Or part of one, anyway. Well-known book titles figure largely in the clues and in the game maker’s dialogue—it would be an interesting challenge to list them all. But actually, books take a definite back seat to the gadgets, animatronic displays, holograms and flashing lights of Mr. Lemoncello’s library. Young readers may enjoy it even though they learn nothing about characterization and logical plotting. But if they want a real puzzle book, steer them to Ellen Raskin’s The Westing Game. 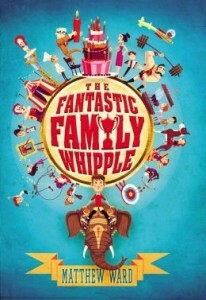 The Fantastic Family Whipple, by Matthew Ward. Razorbill, 2013, 399 pages. Age/interest level: 9-13. On the day Arthur Whipple was born, his fate was sealed: to be the only ordinary boy in a family of extraordinary siblings who hold the world’s record for holding world records. From Largest Number of Coincidental Shared Birthdays in a Single Family to Longest Time Continuously Playing an Accordion, the Family Whipple seemed to have room only for greatness until Artur arrived—seven minutes too early to share the coincidental birthday with his parents and twelve siblings. By age 12, his efforts to establish some records of his own have all resulted in failure and whispers that his birth may signal the return of a mysterious family curse. But a looming disaster and subsequent mystery will help him step up to his calling as Unlikeliest Hero. If you happen to have both a Guiness Book of World Records and a middle-grader in your home, you may well know the fascination that record-making and breaking has for this age group. The Fantastic Family Whipple plays right into this peculiar interest, with its World’s Biggest and Greatest Numbers Of, etc. Arthur’s adventures with a collection of quirky characters and a feisty female sidekick will keep these kids amused for almost 400 pages—with a cliffhanger ending that promises more. The humor, based on outlandish situations and characters, will not be as evident to adult readers but it’s well-suited to this age group. Not challenging but fun, and readers may enjoy thinking up their own world records to try to beat. There are a few references to God’s name (of the OMG variety), which I never think appropriate, but are unfortunately more and more common in children’s literature. For more middle-grade novel of a similar genre, see our review of Chitty Chitty Bang Bang Flies Again and Remarkable. And for some original American tall tales, go here.